Pharma Nord Bio-Chromium 100mcg - Chromium is a trace mineral essential for normal metabolism and growth, being a key factor in the processing of sugars within the body. 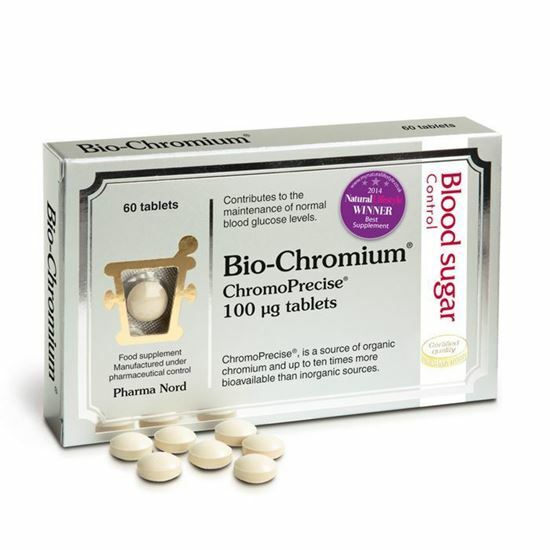 Bio-Chromium from Pharma Nord contributes to the maintenance of normal blood glucose levels. Its ChromoPrecise organic chromium yeast is up to ten times better absorbed than chromium chloride and chromium picolinate forms, which are used in most other supplements. Dietary chromium is obtained from wholemeal cereal and grain products (provided soilsare not chromium depleted), nuts, seafood and yeast. Highly refined foods (e.g. refined sugar, refined flour used inwhite bread) contain little of this essential mineral, which is also easily lost during cooking or food processing. Pharma Nord recommends 1-2 tablets per day or as directed by a physician. Tablets are best taken with food, particularly that with a high fibre content. Chromium is 50 to 200 microgm/day. Chromium supplements should be taken with caution by people with impaired renal function or diabetes (insulin dosage may need to be adjusted). Bio-Chromium should not be taken by those with an allergy to yeast.